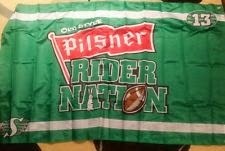 Let's face it, we all probably have a lot of Rider collectibles (some liekly a lot more than others). Ebay can be a great place to find some of those rare items to add to those collections. 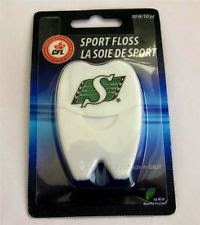 Yes for the low starting bid of $3.98 you can get Rider floss off ebay... please note that shipping will cost $2.69. Curiously this so far has no bids. I really like how its call "Sport Floss" as if that doesn't make the regular old crappy floss you use seem awful by comparison. For just $7.99 plus $12.50 shipping you can own a flag that is literally given out with every one of the million cases of Pil sold over the summer. Sure it may cost a bit more for the case of beer but at least then you have been... and didn't pay for a free flag. 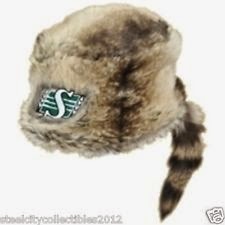 Also currently 0 bids. How can any Rider collection be complete without a signed picture of famed Rider QB Steven Jyles. It's only $14.99. Relive all the cursing and disappointment that characterized his time here by buying a signed picture of him to constantly remind yourself. I realize that the picture doesn't show the entire growth chart but I'm pretty certain that isn't a Riders growth chart. $12.99 if you are still interested. Continuing the theme of trying to profit of of crap they give away for free at the LB you can pay $9.95 for this set of 4 coasters. Honestly I have tons of these just lying around my house (I may drink the occasional Wisers during the season... much like how Kerry Joseph through the occasional pick in the WSF ) that I can just give you. 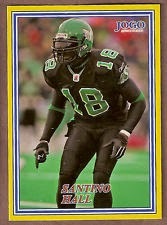 Don't have much to say about this other than "Hey, remember Santino Hall?" I like how the players featured on three of the four coasters are named Ed/Eddie. Almost as if they had a theme in mind. They should make one with Eddie Johnson to complete the set.